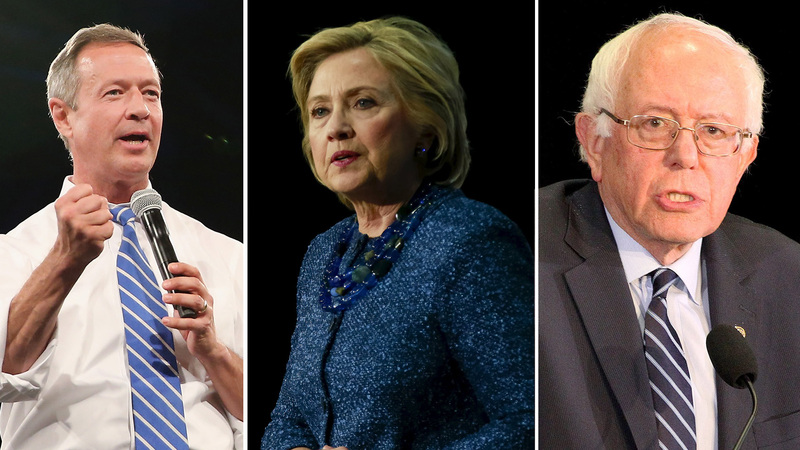 On Sunday night, the three Democratic presidential candidates will face off in their fourth debate in Charleston, South Carolina. South Carolina holds the first-in-the-South Democratic primary on Saturday, Feb. 27. The candidates who will be participating in the 9 p.m. ET debate on Sunday are Hillary Clinton, Sen. Bernie Sanders, I-Vermont, and former Maryland Gov. Martin O'Malley. The debate comes as the Iowa caucuses on Feb. 1 and the New Hampshire primary on Feb. 9 draw closer. The race between Clinton and Sanders has tightened significantly in those two key states and each side has intensified attacks against the other. On Friday, Sanders told CBS This Morning that his latest campaign ad does not target Clinton despite the fact that it blasts one of "two Democratic visions for regulating Wall Street." This week, Clinton's campaign increased pressure on Sanders, who keeps talking about his Medicare-for-all proposal, but he has not yet released a detailed plan and has instead pointed to a proposal he introduced years ago. Sanders, meanwhile, told CBS that Clinton's campaign is getting "very, very nervous" because his poll numbers are rising. At the same time, he rejected the idea that he is now the Democratic frontrunner. A day before the debate, the Vermont senator announced his embrace of new gun legislation, which would amend a law protecting gun manufacturers and sellers from liability after firearms are used in crimes -- an issue Clinton has slammed Sanders over in previous debates. A Bloomberg Politics/Des Moines Register survey released Thursday shows Clinton and Sanders in a virtual tie in Iowa. Forty-two percent of likely caucus goers said they back Clinton while 40 percent said they would favor Sanders. In the last poll, Clinton led Sanders by 9 percentage points. The latest poll found Clinton's supporters haven't shifted to Sanders, but more people now say they are uncommitted. A Marist/Wall Street Journal/NBC News poll released earlier this week showed Sanders leads Clinton by 14 percentage points in New Hampshire. Another survey, also by the Wall Street Journal/NBC News, out Sunday shows Clinton with a wide margin over Sanders nationally, besting the Vermont senator by 25 points among Democratic primary voters. Clinton and Sanders are now trying to demonstrate what a general election race would be like if they win the Democratic nomination. Clinton said on "The Tonight Show with Jimmy Fallon" that it would be "quite the showdown" if she faced Trump later this fall. During the sixth Republican debate Thursday, Sanders tweeted a graphic showing he could beat Trump and all of the other top GOP candidates. Moderators: NBC Nightly News anchor Lester Holt will serve as the main moderator during the debate. NBC News' chief foreign affairs correspondent Andrea Mitchell will also ask questions and others will be submitted by YouTube users.